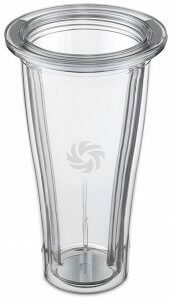 After a long wait, the personal-size blending cups are finally available for the Ascent Series. They are currently selling a 20-oz container kit and an 8-oz container kit. Each kit comes with two containers, two lids, and a blade base. These containers are only for Ascent Vitamix models. (If you have an older Vitamix, you can use the personal cup adapter.) These containers allow Ascent models to blend smaller amounts than they are able to blend in the wide 64-oz that comes with the machines. 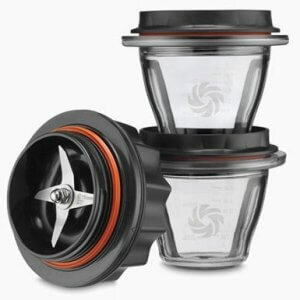 The Ascent 20-oz cups are almost identical to the 20-oz cups for the S-Series and personal cup adapter. However, they use different magnets to activate the self-detect system. (If an Ascent model does not detect a container, it will not run.) The S-Series also uses magnets for container detection, but the S-Series magnets are smaller, so they do not work with the Ascent blade base. You can tell the difference by looking at the lip of the cup. The Ascent cups have a wide lip that extends all the way around the cup. The non-Ascent cups have a single tab on the lip. For example, this is a non-Ascent Vitamix cup, and it will not work with Ascent machines. The cups are double-walled, and, according to my tests, that means they keep drinks cold about twice as long as a single-walled cup. The lids are solid, and well-designed. The number one use of these cups is smoothies to take on the go. They also work for salad dressings, but I think the 8-oz may be even more convenient for most dressings. These bowls are for when you want to blend a small amount. I’ve used them to blend salad dressings and sauces. I’ve also heard that people are excited about using them for blending baby food. The lids make storing leftovers convenient. However, note that the magnets in the container mean that these are not microwave safe! Since these containers completely seal, blending is a bit different from the classic Vitamix experience. You can’t use a tamper, which means that we won’t be able to use them for super-thick blends. However, it’s convenient to pick them up and give them a shake if the ingredients get stuck. These containers are not suitable for hot liquids, because they are unvented and pressure can build up. For that reason, when an Ascent base detects one of these containers, it disables the hot-soup program. It also adjusts the other program modes to shorter times, to account for the smaller container. Have you had a chance to test these yet? 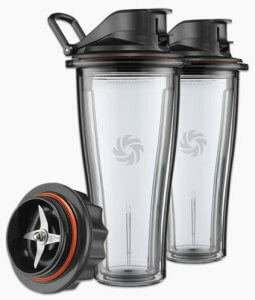 They released similar personal cup containers for the legacy blenders and early reports have not been very positive. Most complaints center around the way the cup narrows toward the top (when on the blender) that the contents are frequently get stuck at the top and do not blend well. Considering the 20oz containers alone are almost twice the cost of a nutribullet pro system they better work amazing. I’ve used the 20-oz cups and will be testing the 8-oz ones soon. Ingredients do need to be smaller to blend easily in the 20-oz cups. I believe Vitamix made the “top” (bottom of the cup once you’re drinking out of it) narrow so that the cups would fit in standard drink holders. The other complaint I’ve heard with the personal cup adapter is leaks, but with the gasket properly in place and screwing it all the way on, I haven’t had leak problems. One nice advantage of these Ascent containers over the personal cup adapter is that the blade base is less bulky. Appreciate very much your comprehensive information! I wondered if the Ascent series did not differentiate between wet and dry blade usage ( blades lifting upward or downward) or will an additional dry blade container be introduced later. I noticed the Vitamix chef’s video using the 8 oz. cups pulverized dry material. This could be another advantage to the series if no separate dry blade container is needed. The standard Vitamix (wet) blades have always been able to handle dry material. It’s just that the dry blade is more optimal. I have heard that Vitamix is planning on releasing a dry container for Ascent, probably later this year. However, one interesting development with the 8-oz containers is that one of the motivations for having a separate dry container is to avoid scratching up your main container, and having a designated “dry cup,” would solve that issue. Another advantage to using the 20/8oz container as a designated dry blending use is cost. If the personal blades worked well for dry goods you can get an extra 20oz container for only $30 (since it won’t require a blade purchase). Where a dry container with dry blade is sure to be ~$150. The 8oz cups seem nice, and I think if you blended a lot of spices or single serving dips etc. they might be pretty handy, but my guess is once you to start loading them up and putting the blades on you get a lot less into them than you think. The technology used is not magnets, but a combination NFC device (def here:https://en.wikipedia.org/wiki/Near_field_communication). I have a set of 20 oz cups on order and will test them within a week or two. I’m familiar with the NFC technology. In the case of the 64-oz Ascent containers, it’s purely NFC. But the 20 and 8-oz containers use a combination of magnets and NFC. As mentioned in both of the articles you linked, they use NFC tags that get activated by the magnets in the containers (via reed switches). Hi, could you tell me if the blade base that comes with 20oz/8oz starter kits can be used interchangeably? If it’s possible then I might not have to get both starter kits, because I could get just the containers off of Amazon. The 20oz and 8oz Ascent containers use the same blade base. I expect to see the containers offered without the blade base at some point. I believe the reason we haven’t seen that yet is because supply is limited by some production delays. However, if you get the containers individually, make sure they are Ascent containers. There is a 20-oz Vitamix container that is not for Ascent, and it looks almost identical, so be careful with ordering. If you buy from Amazon, you want this one. Does the 8-oz container fit the Vitamix S30? How tall is the base + 20oz container combined please? It’s just under 17″ (about 16 ⅞”). If you want to do thicker smoothies with these save your $ and buy a nutribullet. I just had a set of the 20oz come in and tried making a few smoothies side by side with the nutribullet lean and it was no contest. The design of the 20oz cups simply does not allow the contents to move around enough to blend unless you make very thin/watery smoothies, or you pre-thaw ingredients. I did one cup of strawberry/peaches frozen, with a few frozen cherries and 1 1/4″ cups OJ in both side by side. The Vitamix using the smoothie program didn’t even start to blend anything. I had to run it through the smoothie program 4 times manually shaking the container between tries to get it all blended. The Nutribullet struggled a bit at first but in the end fully blended everything in one go. The vitamix might do better if I had cut up the frozen pieces smaller than they come out of the bag, but the nutribullet had no issue and that’s a huge hassle. Beyond that you can’t drink from the vitamix containers due to the very large lip without using their special top. So if you are going to drink it right after making it that’s just one more thing to clean. Also due to the ribs in the sides of the containers they are more difficult and time consuming to clean. I’d estimate by the time I added up multiple attempts to blend that were required by the vitamix, and the extra cleaning time it was 4-5x longer to do the same job the nutribullet did. The only praise I’d give the vitamix is that once it finally did get liquid enough to blend fully it did blend smoother than the nutribullet. It might work great for doing spices, salad dressings or thin liquid drinks, but for frozen ingredient smoothies if you like them thicker than runny, it’s a fail. I agree that the Vitamix 20-oz containers aren’t good for thick blends. And your supposition is right that the 20-oz containers do better with smaller pieces of ingredients. For people who want to make thick smoothies in a Vitamix, I recommend the 32 or 48-oz container for small to medium blends, and the 64 oz container for medium to large ones. I partially agree with you about the wide lip on the 20-oz container. In my experience, it’s not impossible to drink directly from it, but the wide lip does make it more awkward. It’s a non-issue if you use the lid or a straw. If you’re still within the first 30 days, call up Vitamix and I believe they will be happy to give you a refund, since the 20-oz container doesn’t sound like it works for your purposes. Can I use the 20 oz container with blade inside a low profile jar which runs on a 5300 model? Please let me know. No. To use a 20-oz container on a 5300 you need the Personal Cup Adapter. I have the Ascent 3500 and purchased the 8 oz blending cups that came with the blade that screws on. I did not purchase the 20 oz blending cups but they sell just the 20 oz cup on other sites by itself without the blade. Since I got one blade with the 8 oz ups it would be a lot cheaper for me to just purchase the 20 oz cup from one of the websites that don’t come with the blade if they are the same size and just use my blade assembly from my purchase of the 8 oz cups if it will fit. Does anyone know? Yes and no. You will need a 20-oz Ascent cup, which can be bought without the blade assembly here. If you shop somewhere else, you have to be careful that it is an actual Ascent cup. The Ascent cups have a wide lip that is even all the way around. The S-Series/non-Ascent 20-oz cup has a “tab” in the lip, and it will not work with Ascent machines. For example, this cup has the tab, and it will not work on Ascent models. Thanks for your question. I am going to update the post to make this more clear.